Four businesses have been ordered closed until further notice by the St. James Health Department for breaches of public health standards. The four were among 26 business places which were given the green light last week by the department to resume operations, after they were forced to curtail business activities due to the impact of floodwaters on the premises and products since November 29. Lennox Wallace, Chief Public Health Inspector for the parish of St. James, told the Western Mirror that some business operators were seeking to try and beat the system through devious means. 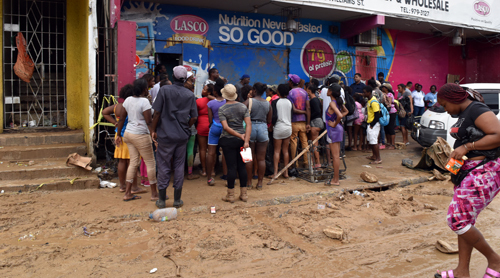 Mr. Wallace said operators of wholesale businesses affected by the floodwaters had put out food on the street and these were being picked up by people. “We called in the Solid Waste Management team and the police to assist us, so we seized and condemned foods that we believed were contaminated. The foods that were seized were immediately denatured (rendered unfit for human consumption) and transported to the Retirement Dump under police cover. This was to ensure that persons living in and around neither ate, nor offered it for sale,” Wallace explained. He said a team of 35 persons from the health department is now out in the field constantly monitoring food establishments to ensure that they are maintaining public health standards.